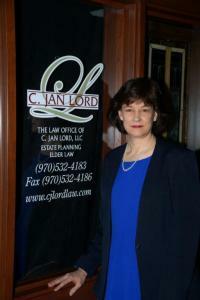 A graduate of the University of Colorado School of Law, Jan has practiced law since 1983. While she has broad legal experience, her passion for helping the elderly led her to the practice of elder law. Having watched and assisted with her father’s passing in 1998, Jan has the compassion, understanding and the ability to address the hard questions that arise for the elderly. Through her business — The Law Office of C. Jan Lord, LLC — Jan serves the unique legal needs of northern Colorado’s elderly. The protection and transfer of wealth can be complicated and difficult, and Jan is dedicated to providing legally sound and practical guidance. As part of her dedication, Jan regularly provides seminars for various groups regarding elder law issues, estate planning and can access nationally recognized experts when necessary. Home grown, mostly, in northern Colorado, Jan is familiar with the high plains and even higher mountains. A product of Sterling High School, Jan completed her undergraduate education at Colorado College. She and her family have lived in Berthoud since 1998.